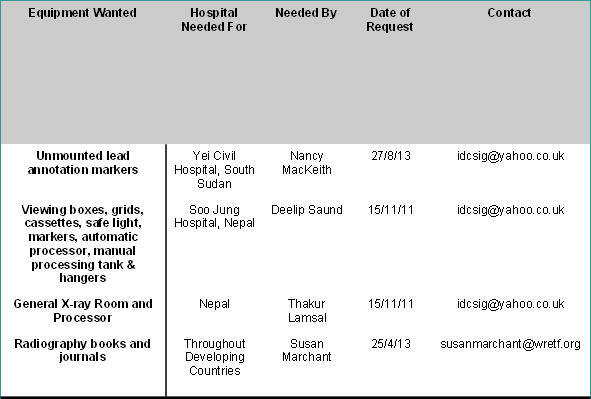 If you have surplus equipment to donate, or need equipment for a �not for profit� hospital in a developing country please contact idcsig@yahoo.co.uk to have your equipment / requirements added to this list. This list is maintained by the IDC-SIG to put those with surplus equipment in touch with those needing it. Whilst we will try to provide support, all arrangements for collecting and shipping equipment must be made by the individual wishing to send it. Before sending equipment overseas please read our advice on sending equipment to developing countries by clicking here.